I recently received a refill puck of The Holy Black Gunpowder Spice and bought it specifically for the scent. I had an extra PETG jar to put the puck in but I didn't realize how hard the soap would be and it's not possible to simply smash it into the jar with my thumbs. 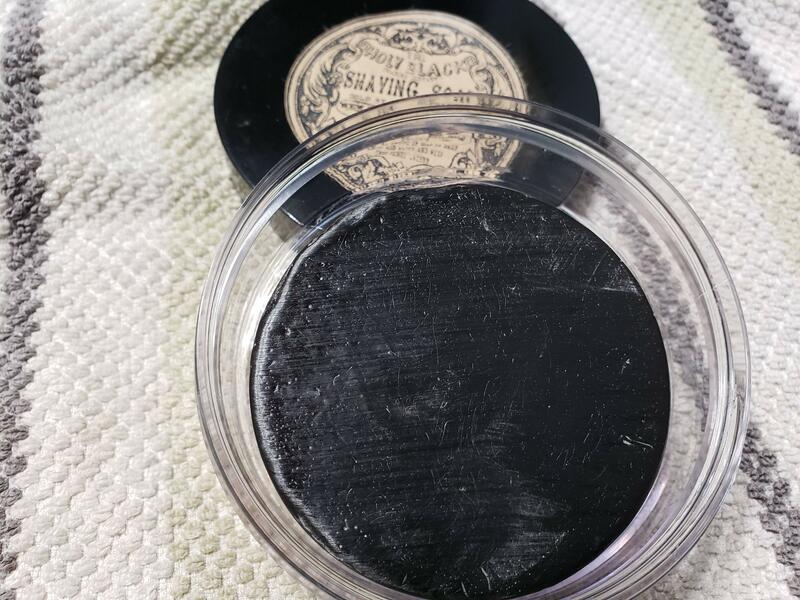 Per the Holy Black website, the soap should be a cream-color but the puck I received is black. I'm assuming there was a formula change but I don't know that for certain. Based on my limited knowledge, I think the puck I received is a glycerin-based soap. I would like to soften or melt the soap in order to get it to fit into the PETG jar. Has anyone ever tried microwaving a soap in order to soften it? Or does anyone have a better suggestion? Am I going to ruin the soap if I try to heat it up? Here's a pic of the puck in the jar. Microwaving may do an irreversible damage to the soap imo. Checking with the manufacturer is what you should be doing instead. (03-23-2019, 01:49 PM)jags009 Wrote: Checking with the manufacturer is what you should be doing instead. Grating is always a good option, as Senate515 said. I’ve done that with a few soaps, and I liked how they turned out. The trick is to really pack the “shavings” into the jar, so that you don’t have any air pockets inside the product when you’re finished. Notice, though, that if the soap is the least bit soft, grating it can be a bit messy. One option, then, is to put the soap in the freezer for a while, before grating it. I'm with Matsilainen as well as the other guys. They may have made a mistake and sent the wrong product. Also, Heating the soap may well cause the fragrance oil to evaporate. When I have a soap that performs well, yet doesn't have the scent I want, I often melt it in a double-boiler to remove the scent and then add my own. The Holy Black replied this morning. Apparently, they no longer produce the hard glycerin pucks, so to answer that question, yes they have a new (couple years now) formula. He did indicate it was ok to microwave the older pucks to soften them up...just do so in 10 to 20 second bursts so you don't overheat the puck. (03-25-2019, 01:54 PM)HoosierShave Wrote: The Holy Black replied this morning. Apparently, they no longer produce the hard glycerin pucks, so to answer that question, yes they have a new (couple years now) formula. He did indicate it was ok to microwave the older pucks to soften them up...just do so in 10 to 20 second bursts so you don't overheat the puck. Didn’t you say in your original post that you recently received the puck? Wouldn’t that make it a new puck and therefore not advisable to microwave? I didn't buy it from The Holy Black. He did indicate it has been a few years since they made the glycerin-based soap and the merchant i bought it from must have had some in inventory. Ideally, I would have received the newer base...but honestly, I made this purchase because of the scent. I figured as long as it lathers, I would be ok with it.